Posted by jeremyliew in communication, Consumer internet, Internet, Search, social networks, web 2.0, wiki. Recently Ben Elowitz, CEO of Wetpaint, wondered why the term “wiki” was not better understood. 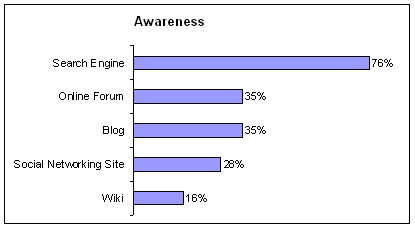 Wetpaint (a wiki company), prompted by wiki being listed as one of the top 10 most hated internet words, commissioned a survey to ask online users about their awareness of wikis, as compared to blogs, social networks, forums and search engines. Since these were online users (not the general population) this could be construed as discouraging; many don’t seem familiar with the basic technologies behind the modern web. However, I think that the data is misleading – while many people may not know about the technology, they do know specific examples of these technologies. As always, people focus on how their problems are being solved, not on what technologies are being used to solve those problems. Take search as an example. Although only 76% of internet users were familiar with the term “search engine”, Google was recently announced to have the most powerful brand in the world. It beat household names like Coca Cola, Marlboro and Toyota. Its hard to imagine that there are ANY internet users who don’t use a search engine an a regular basis, whether they know the term of not. 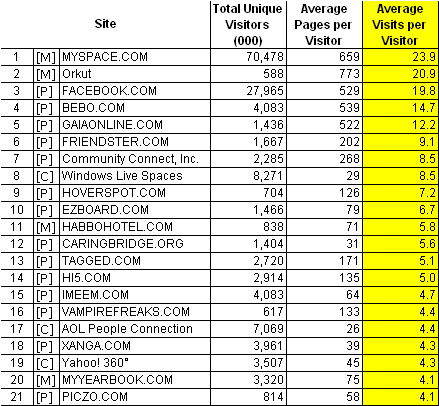 Similarly, although only 28% of the surveyed audience were aware of the term “social networking site”, according to Comscore 64% of US internet users visited a social network in June 2007, with 39% visiting MySpace alone. Awareness does not appear to be a barrier to usage. In the most successful consumer technologies, the technology becomes transparent to the user. Apple has sold over 100m iPods but I’m sure that many iPod users will not be familiar with terms like MP3, AAC or DRM. Users of cordless drills may not be familiar with the term Lithium Ion, even though that is hoe their drill became cordless. Posted by jeremyliew in advertising, business models, Consumer internet, Digital Media, Internet, media, viral, viral marketing, widgets. Marketers are always looking for new and innovative ways to break through the clutter and get their advertising message across. This is true across all media. In TV, some advertisers are looking beyond the 30 second spot to sponsor a whole show, do product placement and even user generated ads on TV. In print, some advertisers are looking beyond standard 4 color full page ads and have experimented with buying out a whole issue, and even scratch and sniff ads. But in traditional media, as you can tell from the links- these events are rare enough to be newsworthy. In online, advertisers look beyond standard ad units (buttons and banners) as a matter of course. Everyone wants to do something innovative, whether it be widgets, viral video, sponsorships, takeovers or immersive campaigns. This novelty-seeking mindset is increasingly typical of the new, online-focused, boutique agencies. They are all looking to demonstrate their creativity and thought leadership. A couple of weeks ago New York magazine had a great article about the new guerrilla ad agencies and the viral ad campaigns that they are creating. It highlights one of the most successful viral marketing campaign to date, a viral video where Marc Ecko purportedly tags Air Force One with their “Still Free” graffiti logo. Apparently, “including media coverage” the video has had 115m impressions. Despite its “homemade” feel, the video cost nearly $400k to shoot ($150k went towards repainting an old 747 to make it look like Air Force One). That implies a CPM of around $3.50 on production costs alone – pretty good for online video advertising if these were the only costs. These increased costs are not confined to the startup boutique agencies either. At GM Planworks (the division of Starcom MediaVest dedicated to managing General Motor’s $3.2bn ad spend) the number of employees has grown from around 200 in 2000 when the group was formed to about 500 today, primarily driven by the increase in people dedicated to new media. Yet GM spent only 10-15% of its ad budget online last year. The cost of online creative and production as a percentage of ad spend is much higher than it is for traditional media, in large part because of the urge to do more innovative creative executions online. Often advertisers and agencies don’t have the in-house capabilities to even do the creative for the “something new” that they want in new media. At the Ypulse Teen Mashup conference last week, Craig Sherman (CEO of Gaia) spoke about Gaia’s recent immersive campaign for Scion which will allow Gaia users to buy Scions, trick them out and race them. It’s an exciting embedded advertising campaign, but a significant custom integration effort on Gaia’s part. Similarly some big advertisers have started to launch widget marketing campaigns through partnering with Clearspring. But it’s been up to Clearspring to supply the professional services to make the widgets; the advertisers don’t have that skill in house. This custom work isn’t something that only startups have to do either. Even Yahoo and AOL have teams within their ad sales groups dedicated to doing custom creative for special sponsorships and promotions that involve non standard ad units. Often this creative work isn’t charged for but is “eaten” by the portal to sell the whole advertising package. The quest for innovation in online advertising comes with higher production and creative costs. As the online ad industry matures, I would expect it to evolve to look more like print, TV and other more mature ad markets. In these more mature markets the majority of campaigns are more standards based and less customized, and the costs of production and creative come down as a proportion of the overall marketing budget. I’d be interested to hear about readers’ experiences with highly customized campaigns and their costs and effectiveness. Posted by jeremyliew in ad networks, advertising, portals. The NY Post breaks the news that AOL has bought Tacoda, the leading behavioral targeting ad network. I wrote a guest piece on Venturebeat that went up last night about vertically targeted content sites and how they can add value to both synthetic channels and behavioral networks, topics I have blogged about here in the past. 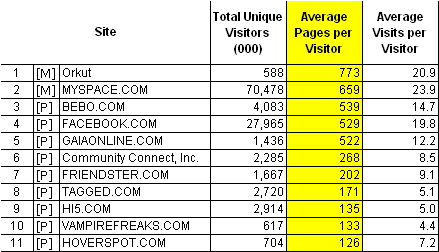 Last night’s post on the top social networks by engagement provoked some good response. Some readers questioned whether Pageviews per user per month was the best measure of engagement given that some social networks make use of AJAX and other RIA (Rich Internet Application) tools that would reduce pageview count. 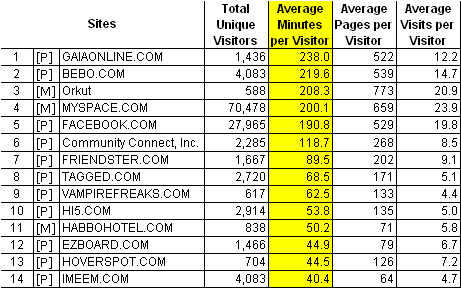 The top five sites by PVs are still the top five sites by time spent and there is still quite a gap between them and the other social networks. Notably, Gaia jumps from being number 5 by PVs/user/month to #1 by minutes/visitor/month, reflecting the fact that a large portion of its use is a casual immersive world delivered in Flash (which isn’t counted though pageviews). Other than that the rest of the list is largely the same. It seems like at a high level both measures of engagement come to the same conclusions. Posted by jeremyliew in auctions, ebay, Ecommerce, economics, irrational. USA Today has a fascinating article today about how some economists are puzzled by irrational eBay buyers. (via Techmeme). The article summarizes research by a number of economists. One showed how buyers in an auction frenzy will bid an item up above “buy it now” prices – almost half the time! Ms. Malmendier tracked 166 auctions offering CashFlow 101, a personal-finance-themed board game. During the seven-month trial, the game’s designer sold the box set on his website for $195. Meanwhile, eBay sellers usually offered an opening price of about $45 and set a one-click, “buy it now” price of about $125. It looked like a great deal for buyers. They could pay less than retail to end the auction immediately or place bids in the hope of fetching an even lower price. But this is where eBay users fell prey to what Malmendier and her coauthor, Stanford University economist Hanh Lee, call “bidder’s curse.” Apparently, some bidders grew so enthusiastic about winning the auction that they lost sight of the “buy it now” price, sometimes offering more than $185. “We found that in 43% of the auctions the bidders ended up paying more than the ‘buy it now’ price,” Malmendier says. Other researchers also found that buyers will often ignore shipping costs in their bidding. Instead of observing auctions initiated by others, like Malmendier, Hossain posts his own controlled auctions. He offers identical items, but plays with the specifics of the sale. For example, he auctioned pairs of popular music CDs. One copy would start at $4 and include free shipping. The other would open at 1 cent but charge $3.99 for shipping. Either way, the initial cost was four bucks. But bidders didn’t see it that way. On average, the low-cost, high-shipping auction attracted more bids, more bidders, and 25% more money. The article summarizes other research findings as well and is a fascinating read. … Katkar and Reiley put the theory to the test by simply selling 50 matched pairs of collectible Pokemon cards, half with an open reserve price and half with a secret reserve price of the same level. Their conclusion, contrary to the theoretic argument, is that secret reserve prices are counterproductive. Far from stimulating interest, they seem to put bidders off, perhaps out of fear that a secret reserve is secret because it is far too high. Not wishing to waste their time, many of them just click “back” on their browsers and find somewhere else to bid. Posted by jeremyliew in communication, Consumer internet, facebook, Internet, performance, self espression, social media, social networks, user generated content, web 2.0, widgets. Its now widely agreed that the two most common behaviors on social networks are self expression and communication. Most of the online revolutions have been driven by new forms of communication. This started with Usenet and BBSs back before there was an internet, moved through the chat rooms of early AOL, the mainstreaming of email and the instant messaging revolution with AIM and ICQ. Communication has always been a large portion of overall time spent online because it drives both frequency of visit (people check for communications often) and depth of visit (reading and responding to your messages takes time). Social network private messages look a lot like webmail. Public comments on social networks are newer and more interesting. Indeed, Danah Boyd includes public comments as one of the three defining features of social networks (along with Profiles and Friends lists). Unlike message boards, public comments “belong” to a single person and are addressed directly at them. But as Danah has also pointed out (I wish I was half as smart as her! ), there is also a performance component to public comments on social networks. This is best understood with an example. Suppose it’s your birthday, and I know it. If I send you an email wishing you “Happy Birthday” then you’re happy that I remembered. This communication is part of the social lubricant on which relationships are built. But supposed that I post “Happy Birthday” to your Facebook Wall instead. Then not only do you know that I remembered, but ALL OF YOUR FRIENDS know that I remembered as well. They may find out from the feed, or by visiting your page, but they will know that I’m a good enough friend of yours that I know when is your birthday. That is the performance element of the communication. The collection of ‘Friends’ is not simply a list of close ties (or what we would normally call ‘friends’). Instead, this feature allows participants to articulate their imagined audience – or who they see as being a part of their world within the site. While SNSes have millions of users, most participants only care about a handful of them. Who they care about is typically represented by the list of Friends. If an individual imagines her profile to be primarily of concern to a handful of close friends, she is quite likely to have very few ‘Friends’ and, if the technology allows it, she’ll keep her profile private. If she wants to be speaking to her broader peers, her Friends list is likely to have hundreds or thousands of Friends who are roughly the same age, have the same style, listen to the same music, and are otherwise quite similar to her. She is also quite likely to keep her profile publically [sic] visible to anyone so that she can find others in her peer group (boyd 2006). Historically, the Wall (Facebook)/Friend’s Comments (Myspace, Bebo and others) has been the only place on a profile where another user can put something on your page. The rest of the profile has been completely under the author’s control. However, some of the Facebook apps have changed this paradigm. A number of the most popular apps allow another user to put something on your profile, including #2 Graffiti, #7 X me, #8 Superpoke, #9 Free Gifts, #15 Superwall, #16 Foodfight and lots more. [Note: X me and Superwall are both owned by Rockyou, a Lightspeed company]. In my own experience, performance is an aspect to the use of these apps as well. I feel a certain pressure to choose something “clever” to X someone (e.g. “defenestrate”, “disdain” or “milk”), and if I’m leaving graffiti on a friends page, I try to make it good. The popularity of these apps suggests that social network users are craving more stages for their performances. I’d be interested to hear what readers think. Reminder: please switch your RSS feed to feeds.feedburner.com/lightspeedblog – it helps me keep track of RSS readership. Thanks a lot! Posted by jeremyliew in advertising, Internet, self espression, social media, social networks, viral, viral marketing, web 2.0, widgets. I’ve been traveling a bit this week, speaking at Widgetcon on Wednesday and at Community Next on Saturday. Both panels were on the topic of viral marketing; at Widgetcon with a focus on how brands can use widgets for marketing, and at Community Next with a focus on how to measure viral campaigns. Dave McClure moderated the panel at Community Next and conducted an interesting experiment with the audience that really encapsulates some of the key lessons of viral marketing. He seeded two memes into the audience. One person was asked to start saying “meep” repeatedly. Another group of five people were asked to put their hand onto another person. The idea was to see which memes spread furthest in the audience. The “Meeper” juiced up the visibility of his meme by adding an element of clapping as well (“meep”, clap, “meep”, clap etc), and walking up and down the front of the stage. Initially maybe 10 people near the Meeper started to meep as well (and clap – more clapping than meeping actually) but this eventually died down as it failed to get picked up more broadly. The initial early adopters started to feel self conscious when no one followed them, and stopped meeping. At this point, the people on stage still had no idea what the second meme was until Dave asked how many people were touching someone else. About a third of the audience, maybe 50 people, raised their hand. Although it initially lagged, the second meme had far outpenetrated the first. 1. A “high visibility” app can get quick pickup among early adopters very quickly. “High visibility” can be caused by a high invite rate, inviters who invite a lot of people on average, or simply something that is extremely visible and obvious (e.g. music on your profile page, or some guy walking up and down the stage clapping and saying meep). 2. High visibility can cut both ways. New users who are seeking social proof can see who is adopting, and decide whether or not they are “like me”. 4. Product matters. While a highly viral app can get distribution quickly, if the uninstall rate is high then it never gets beyond a certain size. While virality dictates the speed of growth, uninstall rate (typically a function of product quality) dictates saturation size, which in many cases is a more important business driver. 5. It helps to start virality from a larger base. Viral marketing is a probability driven game, and if you don’t have enough initial seeds then a failure of virality from any one seed can stop all growth immediately; with more seeds you have more “shots on goal”. A lot of the same lessons came out of the panel discussion at Widgetcon. There was a real focus on asking what should be the right metrics for measuring “success” for a widget based marketing campaign. CPM and pixel count (728×90 etc) didn’t seem to be the best way to measure and sell advertising when users voluntarily affiliated themselves with a brand. Echoing lesson #4 above (Product matters), most of the panel came back to engagement with the widget as the key metric for success. If the widget isn’t good, users won’t engage. As the industry’s attention turns to the tactics of viral growth (whether through email, cross sell, calls to action, optimization of color, font, copy and position etc) it’s a good reminder that, as has always been the case, product matters more than marketing (whether viral or not). Posted by jeremyliew in facebook, VC, Venture Capital. As the WSJ announced today, Chamath Palihapitiya is leaving Mayfield to join Facebook as VP of Product Marketing and Operations. I used to work with Chamath at AOL; he was GM of AIM and ICQ while I was GM of Netscape. Chamath is brilliant; visionary, thoughtful, charismatic, charming and very, very smart. At AOL he was a tireless advocate for the user experience. It is no accident that at the age of 30 he has achieved so much. While some who do not know him might question the hire, I have no doubt in my mind why Facebook would want Chamath on their team. He will add a great deal to the company, and Mark pursued him for some time. On a selfish note, I am also somewhat glad that Chamath is out of the Venture Capital business. I think that had he stayed, he would have been one of the best investors of this generation. Entrepreneurs that I have met hold him in high regard. Congratulations to Chamath and to Facebook.